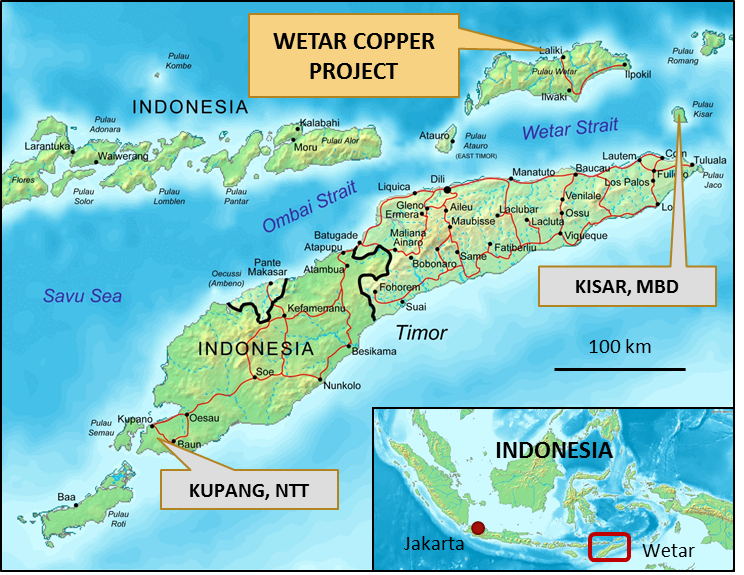 The Wetar Copper Project is located on the north central coast of Wetar Island and is part of the Maluku Barat Daya Regency (MBD), Maluku Province of the Republic of Indonesia. Wetar Island is a remote island which supports a total population of around 9,000 people. It can be accessed by boat from a number of ports including Alor, Kisar and Atapupu and by LCT (landing craft). The closest villages to the project, Lurang and Uhak, have a population of around 900 people in total. The geology of Wetar Island is composed entirely of Neogene volcanic rocks and minor oceanic sediments. Submarine basaltic-andesites with local pillows form the volcanic basement to the island. The basaltic-andesites are intruded by rhyo-dacite domes and overlain by dacitic lavas, tuffs and breccias, debris flows, globerigina limestones and lahar deposits. The age of the mineralisation has been estimated at around 4.7 million years. Copper mineralisation at both Kali Kuning and Lerokis occurs predominantly within coherent massive sulphide units with a lesser amount of generally lower grade material occurring within intensely clay-sericite pyrite altered andesitic tuffs in the footwall and lateral extent of the massive sulphide units. 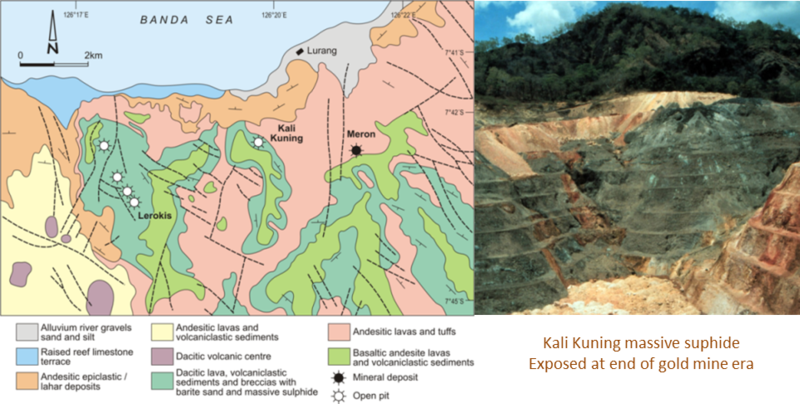 Based on Finders’ drilling, the Kali Kuning massive sulphide resource has been re-classified into three metallurgical sub-types – Leached, Transition zone and Primary massive sulphide. The Leached and Transition types reflect incipient in-situ leaching of the massive sulphide unit by natural groundwater. The Transition zone material although of lower copper grade than the main Primary massive sulphide (1.5% vs 2.9%) contains a higher proportion of readily leachable copper minerals. The mineralogy of the Wetar orebodies consists predominantly of primary and secondary copper sulphides hosted in massive pyrite (70% – 85%). The predominant secondary copper mineral is covellite at Kali Kuning. The Lerokis orebody contains mainly covellite and chalcopyrite. A 100,000 t bulk sample was crushed and stacked into 4 bunded heaps, with variable heights, to allow for testing of different leaching variables in each heap to assess optimum parameters such as crush size, aeration and irrigation rates. 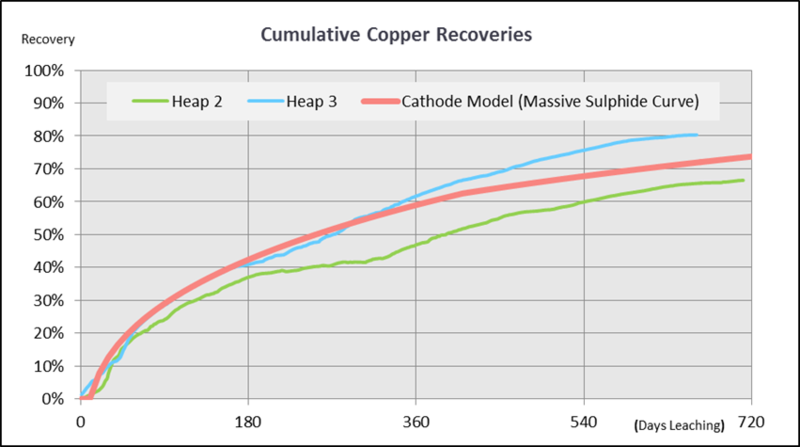 Heap 3 had the best results with a total recovery of 80.3 % Cu after 645 days leaching estimated from metallurgy accounting. Close down drilling after leaching had been terminated confirmed recovery of 87.5%. The average of incremental acid generated for typical heaps was 1.2 kg acid/kg Cu Leached, thus process solutions require neutralisation in commercial operations. Irrigation and aeration application rates proved to be effective controls on temperature. Heaps operated at an average sustained ore temperature of 75 – 85°C. The Solvent Extraction and Electrowinning plants achieved nameplate capacity. 99.7% of the cathode produced by the demonstration was sold as LME Grade A product. Model leach recovery kinetics based on the commercial scale heap heights during the demonstration phase have been used to generate production leach curves in the BFS. Finders currently holds its interest in the Wetar Copper Project through 78% owned subsidiary, PT Batutua Tembaga Raya (BTR), which is a limited liability foreign capital investment company (PMA) industrial copper plate manufacturer established under the laws of the Republic of Indonesia. BTR in turn holds 70% of PT Batutua Kharisma Permai (BKP) which is the registered holder of the mining tenements. The remaining 30% is held by Finders’ local partners, Gabriel and Henry Mbatemooy. Under an Ore Sale and Purchase Agreement BKP has agreed to sell all the project ore to BTR. Through its shareholdings in both BKP and BTR, Finders has a 74.1% economic interest in the project. BKP is the relevant entity for the purposes of Indonesian local ownership requirements. BKP’s local ownership of 30% is sufficient to satisfy the local ownership requirements until 2021 by which time the ore will have been completely mined in the absence of any additional discoveries. Borrow and use forestry permit SK. 478 / Menhut-II / 2013 dated 3 July 2013 valid for the duration of the Mining IUPs. About 50% of the project area occurs within the boundaries of the former gold operations. This land is largely owned by the local government although traditional land rights exist. BTR rents the land from the local government and has compensation agreements in place with traditional land users. In December 2013, the Indonesian government released a new spatial plan for the Province of Maluku. Under the new spatial plan, the entire area of the Kali Kuning resource, the processing area for the project, and most of the Lerokis resource has been re-zoned as non-forestry land. All of the Meron resource is now also zoned non-forestry land. The new spatial plan provides additional flexibility to optimise the mine design and operations.